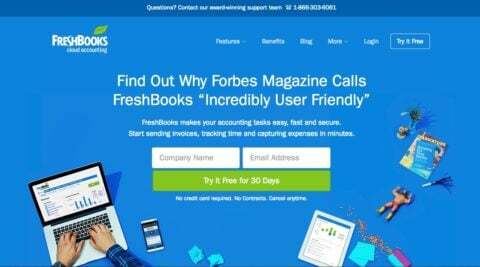 Talking about best accounting software FreshBooks, it can save considerable time and avoid complications when it comes to the stressful field of accounting. With its efficient invoicing features, excellent mobile apps and a streamlined interface, this software eliminate the stress of book keeping and getting on time payment. FreshBooks provides various packages for accounting software, catering to a variety of business sizes and models. The Sprout package is the newest and the smallest addition to the lineup, and it is best suited for people with a small client base as it allows you to bill only up to five clients. Another package, Seedling provides billing support for up to 20 clients while the Evergreen packages provide support for 200 clients. The Mighty Oak package allows you to bill an unlimited number of clients. When it comes to tracking expenses, billing clients and performing other standard accounting tasks, many things can go wrong. FreshBooks eliminates this stress and makes the process pleasant. As you open the interface, you can create a new client, brand your account and sent a test invoice all in first 10 minutes of use. It provides the most streamlined interface. One doesn’t have to be a pro in accounting and knows all the terminology to perform the required and necessary tasks. This software still provides all the necessary data an accountant may require to prepare your taxes for you. As one goes on to adding more clients and sending more invoices, this software makes the process go swiftly through a multitude of dropdown inventory menus and auto-fill features. After creating the client accounts, this software auto-fills the client’s default preference language and currency into the invoices. When one creates the invoice, this software also adds other stored client data that you may have added before and it will easily calculate any applicable taxes and discounts. While one can send invoices via email or save them as PDFs, FreshBooks also provides the ability to send them via snail mail too. FreshBooks can also help you manage budgets, projects, tasks and team members. You can also set various levels of permission for members of your own staff that also have the access to this software. You can easily adjust the levels of access for clients on your client portal so that others can’t see information that is not relevant to them. To create your business profile within this software was a simple affair.FreshBooks walks through all the necessary steps and even includes few getting started video tutorials you can view to learn the process. Adding and managing complex inventory situations and vendors is particularly hard with this software. The software can save inventory items that you enter, along with tax rates corresponding to them, product descriptions and unit costs. Setting up this software is easy as it has free apps for both Android and iOS smartphones and tablets. You can also get access to your dashboard on mobile browsers through a rather simple sign in procedure but using the apps is quite easier and more reliable. The method of support provided by FreshBooks is quite good. Every customer service personnel is professional and knowledgeable and answers your queries within a small time period and minimal waiting time. You can also use FreshBooks user community and find your answers from other users of this software. You can find support content in videos which are regularly updated and are quite helpful. It also holds regular webinars that are quite useful for the users. Using this accounting software, you can easily keep your books and accounts in order, get timely payment and spend less time over complicated accounting tasks. With multiple client support with various locations and currencies, you can be sure that this software will easily handle most of the complex situations you might encounter. Even with the lack of inventory features, FreshBooks still makes a good choice for professionals looking to reduce their accounting time.